It's time for another round "for great justice" as Capcom delivers its fourth solid legal case-solving game in a row. Apollo Justice: Ace Attorney is a fantastic legal simulator FOR GREAT JUSTICE! Yeah, I know, I've worn out the "All your base are belong to us" reference in my previous review of Pursuit Force: Extreme Justice, but let's face it, the phrase has some justification here in this, Capcom's fourth legal simulation game. But I won't wear it out into the ground, because we already know how the "great justice" theme should work here. Apollo Justice, a young upstart just getting his feet wet in the world of defense attorneys, takes over the reigns from mainstay Phoenix Wright and tries to hold his own against insurmountable odds, particularly characters who spew alibis, lies and character quirks that look like something you'd spot in a really bad soap opera. Probably the worst of the bunch is Klavier Gavin, a prosecuting attorney with a huffy attitude, a tendency to mix German into his everyday speak, and, of course, a double life as a rock star, the lead singer for the Gavinners. Other characters include a dorky (but lovable) 15-year old magician named Trucy who lends you a hand, along with a couple of old faces making a return. Phoenix Wright is back, but he's traded his legal skills for gambling, like any down-on-his-luck attorney might do. It's characterizations like this, tied into well-written storylines, that help games like Apollo Justice: Ace Attorney move along swimmingly throughout each of its cases. To help his means of legal briefing, Apollo has a few tools to his credit. 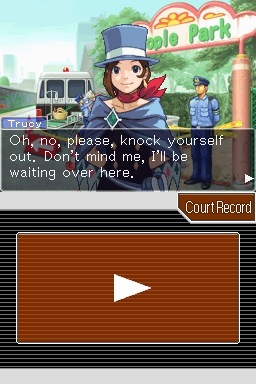 This is the first game to fully interface all the great touch-screen tools we saw in the final case of the Phoenix Wright: Ace Attorney game, so you can dust for fingerprints, watch for quirks in witness testimonies (and call them on it) and investigate crime scenes. The game also has the nifty ability of recreating crime scene scenarios with clever video implementation, so you can see every aspect of the event in question and get some answers. 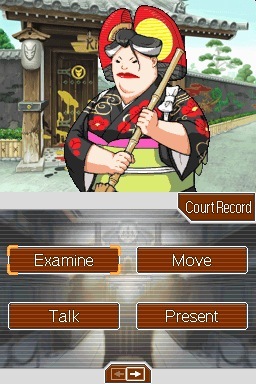 Other than that, the game plays mostly the same as other Ace Attorney games, which means it's still good. The presentation's still about the same as well, too. But that's not a bad thing. Characters animate with few frames but lots of personality, and give off a bright, well-drawn edge. The music is pleasing, while not entirely original, and the sound effects are charming in their own little way as well. There are only two things, however, that are worth mentioning when it comes to buying the game. First, it's very familiar to previous entries, despite the new tools and other things. You're still running the legal gauntlet and not much has changed in that regard. For great justice. C'mon, you knew I'd say it. What's Hot: Excellent touch-screen controls and tools; storyline and characters are as sharp as ever. What's Not: Only four cases, with no new downloadable ones available; reeks of a little familiarity; where the hell's Godot?